Peter Johnsson has documented over 100 medieval swords in private collections and museums across Europe. The scattered remains of past ages have always held a strong attraction for Peter. When, as a child, his parents took him to visit museums, the experience left him mesmerized. The thought of what the fragments of past times might have been witness to stirred his imagination. As many other kids, he felt that armouries, with their dark and suggestive atmosphere, were especially exciting. On his eighth birthday he got a small anvil as a gift from his father. That was something that had profound influence on him. He was deeply satisfied and proud when he, under supervision of his father, forged his first knife from a small lathe tool and was told how to harden it with linseed oil. At that moment a seed was planted. He knew he wanted to learn how to forge a sword - a real one, like the ones he´d seen hanging on the walls of museums and armouries. He hammered happily away on his little beloved anvil, striving to realize the dream, while cold-forging miniature swords from gas welding rods. In the end the anvil got so badly bruised and dented that it was no longer of any practical use. The dream to become a smith would have to wait a few years yet. Instead Peter turned his interest to pen and paper and this eventually led him to take an MA degree in graphical design and illustration. He became an illustrator of children’s’ books, and designer of pedagogical information. He still enjoys doing this on a part-time freelance basis. However, after some years being illustrator, the urge to become a smith could no longer be ignored. 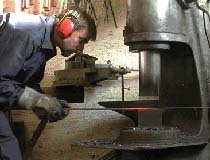 Peter took sabbatical leave from his profession to start learning the trade and craft of the blacksmith by studying decorative metalwork and forging for four years at a school for arts and craft. This was a very rewarding period, during which he got the opportunity to deepen his knowledge about the forging of steel and its heat treatment, which became a special interest. 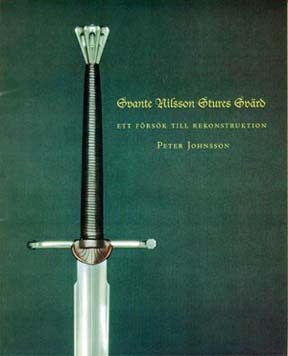 As a final project at this education, Peter dealt with the reconstruction of the sword of Svante Nilsson Sture, who was the regent of Sweden 1504-1512. This was a rare opportunity to study an authentic top quality-fighting weapon from an interesting period in Swedish history. Peter had the privilege to handle the original at several occasions. 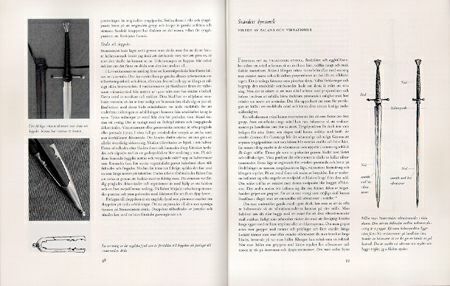 The result of the project was a replica of the original sword and a book dealing with its history, as well as the process of the making of a sword. A sword is a symbol of many things. The complexity of its associations adds to its symbolic power. When you handle a well made sword it is difficult not to be affected by this. The sword represents chivalrous ideals, but it is also the weapon with which the warriors slew the innocents. It is a significant symbol for the continual strife for mastery, for good and for bad. It is a sign of both triumph and defeat. It is a tool whose influence can make man a hero or a mindless destroyer. It takes knowledge to make a sword and it takes experience to know how to wield it, but it has often served powers that are motivated only by prejudice and ignorance. For modern man it might represent a longing back to ages long past which are believed to have been easier to understand and grasp. Still, if a sword is not first of all made to be a fully functional weapon, it is a pitifully foolish thing that cannot carry any symbolical power. A sword must not fail in its practical use. A badly made sword is a very disappointing thing, since sloppy, thoughtless and careless craftsmanship belies the very source of its intrinsic power. The purpose of the shape and dimensions of a sword is to ensure its wielder control of the thin line of its edge, across which it ceases to exist. The need to be alert and conscious about how the overall shape sets conditions for the details, and how the details lead to results in the performance of the completed sword is an inspiring necessity in its making. 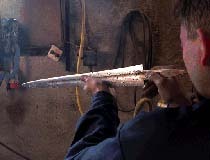 The making of a sword is a joy and a challenge. A sword demands careful consideration and attention to details to be brought to its full power. It is a source of both pride and humility for me as a smith to strive to emulate the stark and elegant simplicity and the high level of craftsmanship of original historical swords. 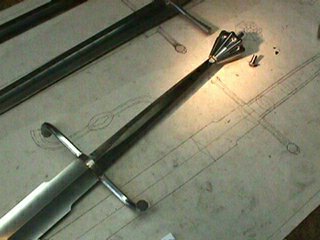 I want the swords I design and make to be true to historical swords in quality, style and feel. To achieve this I continually examine swords in museums and collections, and base my work on observations and notes from these studies. Sometimes I make a direct copy, sometimes I combine features from different swords to make a new one that still has the handling characteristics of the originals and shows a style which is possible to associate with a historical period. I´d like customers to feel that the sword they own is true to its predecessors: a well proportioned, responsive and reliable weapon recreated according to the likeness and example of real historical swords. 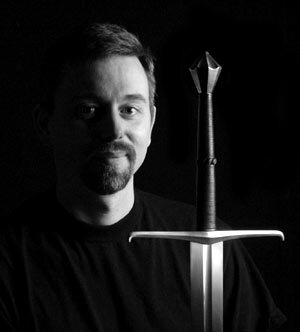 Albion will be introducing truly historic recreations of swords throughout history designed by Peter from his research, the Museum Line. Other swords offered will include original designs by Peter, based on period types and their characteristics, the Next Generation Albion Mark Line.